As announced by Paul (Sariel) at Klocky today, the new TECHNIC sets for 2nd half 2008, are already available at S@H (US) for pre-order. These are coincident to the prices anticipated here at TBs , and still inline with my forecast for for the European price ranges, here. Both the Excavator and the Off Roader description mentions "Download building instructions..." or alternate model. Is this a new thing Lego is doing? Are they trying to save a little on the cost of production? 'Or alternate model' really means 'for alternate model'. Curious is the fact that the Handler (8295) seems to include the instructions for the alternate model ??? Nevertheless we should remind the same already happened with the Bulldozer (8275) last year. However majority claims interest on the B-models and LEGO is taking instructions out of the box. Oh I don't know. It may be a method to cut costs but, I would leans towards them driving you to their site to explore option things (buy more stuff). Anyway this is exciting news. Wish my remodeling was complete so I have space to build! egads I am typo king! It's not so much the means of downloading other instructions so much but that the printed instructions in the box are most likely to last longer and be a bit more durable than ones printed from a computer printer. Dang, I saw news of this at Brickset and came here to post about it but I was too late! As for the downloadable instructions, I see them as a way to reduce costs... if that brings benefits from LEGO and allows for more parts/design budget, then so be it. What I find strange is that the Telehandler appears to come with the instructions in the box. Another theory, in which the Telehandler's case fits, is that LEGO simply didn't manage to create the instructions in time for release... that would explain why the Bulldozer's alternate model instructions became available only some time after the main model went to stores. I bought the handeler, and there were no B-model instructions. and it said on the back of one of the books to go online for B-model instructions. Hmmmm. strange. That's right. 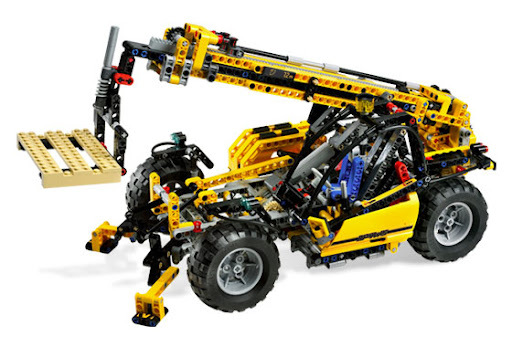 All the new TECHNIC models do not include in the box instructions to build the B-model. They should become available online in some time. These are sets targeted for August/September which for some reason this year became available at S@H in July. Maybe because of that the instructions for B-models are not yet available. For instance, last year 8275 B-model instructions, just became available in middle of October.